Located in the community of El Segundo, the comfortable Embassy Suites Los Angeles – International Airport/South hotel is less than 2 miles from LAX. Discover some of the area’s best beaches and most popular attractions from our full-service hotel. Within easy reach of the headquarters of several Fortune 500 companies, the Port of LA and LA Air Force Base, this Los Angeles, CA all-suite hotel offers flexibility and value whether you are staying for a few nights or a few weeks.Remain productive during your stay thanks to the 24-hour BusinessLink™ business center and high-speed internet access. Your two-room suite gives you the space to work or relax, while the microwave and refrigerator allow you to prepare delicious snacks from the comfort of your suite. Work out in the fully equipped Embassy Suites Fitness Center or swim laps in the indoor pool. Start your day in style with a complimentary cooked-to-order breakfast, then unwind with drinks and snacks in the evening at the complimentary Evening Reception*. The hotel’s 1440 bistro & bar takes a contemporary and sophisticated approach to classic American cuisine. * Service of alcohol subject to state and local laws. Must be of legal drinking age. Conveniently located minutes from Los Angeles International Airport (LAX), the DoubleTree by Hilton Hotel LAX – El Segundo is situated in El Segundo's premier business district. This intimate full-service hotel near LAX offers complimentary parking and 24-hour airport transportation. Our welcoming staff will greet you with a warm DoubleTree chocolate chip cookie.Local businesses, including Mattel, Boeing and Oracle, are only a short distance from our hotel. Relax in comfort in one of 215 guest rooms, with smoking and non-smoking options available. Watch a favorite program or a movie on a 37-inch flat-screen TV with HD channels. Each room features a refrigerator and a laptop safe.Take care of business using high-speed internet access. Start the day right with a workout in the fitness room followed by a quick bite or a full hot breakfast at the East Grand Bar & Grille or your room. End the day with a refreshing dip in the heated outdoor pool or a relaxing soak in the whirlpool spa. Consider holding an event or meeting in our 4,500 sq. ft. space, accommodating up to 140 guests at our convenient El Segundo hotel. 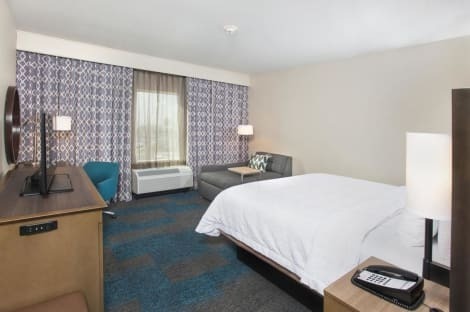 From the sleek design of our lobby to the vibrantly decorated rooms, Hampton Inn & Suites LAX El Segundo is a great choice for Los Angeles travelers. Be close to aerospace companies, the beach and downtown LA.Our spacious rooms feature free WiFi, a 43-inch HDTV and plenty of plugs to charge your devices. Choose a room with a king or two queen beds. Several corner rooms offer full glass balconies. Upgrade to a suite for extra space, a sofa bed and wet bar. Head to the lobby for free hot breakfast each morning, or grab on of Hampton’s On the Run™ Breakfast Bags, available Monday through Friday. At end of your day, stop by the lobby bar and dine on light fare and drinks.Stay committed to your workout goals in our fitness center and unwind in our indoor pool. Finish that last minute project in our business center which provides access to a computer, faxing and printing capabilities. Located in El Segundo (LAX Area), Hyatt Place LAX El Segundo is a 3-minute walk from Campus El Segundo and 7 minutes by foot from Toyota Sports Center. This hotel is 0.6 mi (0.9 km) from Automobile Driving Museum and 1.9 mi (3.1 km) from Lakes at El Segundo. Featured amenities include a business center, a 24-hour front desk, and laundry facilities. A roundtrip airport shuttle is complimentary (available 24 hours). lastminute.com has a fantastic range of hotels in El Segundo, with everything from cheap hotels to luxurious five star accommodation available. We like to live up to our last minute name so remember you can book any one of our excellent El Segundo hotels up until midnight and stay the same night.